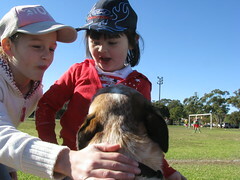 Today we all went back to the Soccer ground so Pumpkin and Chook could play. I had a great time, because my friend Amelia and her sister Teasha were there too. Both teams lost today … but everyone tried really really hard! Now, just between you and me, and you have to promise you won’t tell TBU about this … but I think he is going a little looney! Today he was sticking the camera in my face again and I’m sure he tried to stick it all the way up my nose! How crazy would you have to be to do that? I’m not sure whether it is just lack of sleep or maybe he does need to take a trip to the funny farm! Anyway … I made this video especially for him, and would like to dedicate it to him … just in case he has to go away for a while! Lordy Charlie, what’s with the camera up your nose matie. I’m a bit worried about you though, you were looking a bit green in the video…..
Well, it’s a nice nose. But it’s nice to see you’re so supportive of your TBU. I hope he’s feeling better. My pawrents always feel better after nose kisses. That might help him. It might also be why he was so interested in your nose. Good luck Charlie with your TBU. Hi Charlie, I´m glad you had a great time watching soccer! Your friends look nice! I got a shirt of my favorite time, the São Paulo Futebol Clube! Yeah! I think what he wanted was to share with us a extreme close-up of you! And I appreciate it! 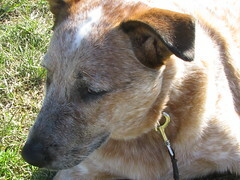 Glad you had a good time watching Pumpkin and Chook playing and mmeting your friends too! My mom takes pics like that! We love the video but the song scared the heck out of us, Charlie! What are you trying to do, man? If TBU isn’t already over the edge, watching that movie will send him there. I mean, come on, even I started freaking out when you were all turning weird colors like some 60’s light show. What is it with the hoomans and their fascination with our Noona’s, Chopps and Paws. Do they not realise that when we turn our head away it means DOGNO!A good bit of slobber on the lens should do it. My word, you are so TOTALLY trying to catch a nap and you get a camera up your nose? That’s terrible! Too bad about the losing soccer game. That is a wonderful portrait of your nose. Hope it wasn’t painful. Looks like you were trying to give him dirty looks and get him to stop. That was so funny. I think your TBU is definitely on his way to the happy home. I think he was trying to find your big brains. Charlie Daniels-do you ever get to play soccer on sundays?? Hi!Charlie.It’s so nice You met pretty sisters.